2:04 testing yesterday's low again; if this trade keeps working, I will carry it through the next trade time. 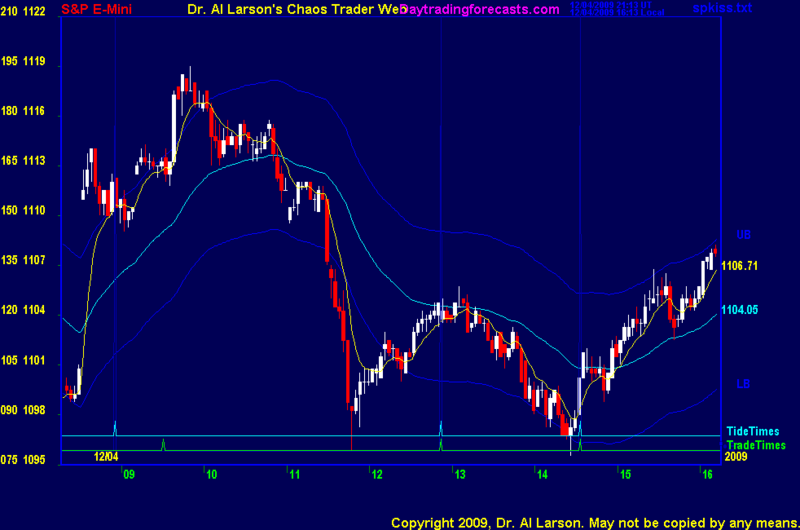 2:00 I have placed a Fractal of Pi chart in the Certified Chaos Trader's Room. It is open to all who have take my four main coures. I took the buy, and skipped the sell. When that happens, I don't chase it because that gets me in too late. 11:10 there was a nice "astro trade" selling 1114 M resistance, covering 1110 Moon support; not a hotline trade so I did not announce it. 9:36 last week has had terrible volatility except late yesterday; Today's challenge will be being patient. 12/4/2009 1:08:11 PM MT pp:: Thanks Al, It was great day. I am going to take courses. Thank you. 12/4/2009 12:51:28 PM MT acetd****:: al can you post that FOP so we can see how your determing the 20 minute time frame? 12/4/2009 9:51:36 AM MT pp:: Thanks Al. I took this short for 8 points gain and exited at 1097.50. Maybe more short coming. 12/4/2009 9:18:16 AM MT pp:: Sorry Al. I am here second day and I don't know yet what is going on. Results are impresive.There is define chanel between T049 and T090. 12/4/2009 9:14:22 AM MT Al****:: this is NOT AN ASTROLOGY system !!!!! 12/4/2009 9:02:59 AM MT pp:: I cannot believe how acurate your astrology system is. i am +2points on short ES.I am going to take course with you. This is something unusual. 12/4/2009 8:29:01 AM MT pp:: Hi Al.My name is Peter. range from 1110 to 1119 could be enough for scalp. Is there way how to scalp with one of your systems? 12/4/2009 8:13:48 AM MT pp:: After NFP large move it's not surprice that market will slow down. Energy was used for NFP move. 12/4/2009 7:51:18 AM MT TG****:: I've had a number of trades get to just over 4 points of gain the past several days only to reverse and stop me out for zip. This morning, bought the preoutcry range break at 14.5 and decided to take the 4 points. Now it will probably make me look silly and go for a quick 9. 12/4/2009 7:28:56 AM MT pp:: Good morning. I am new here. Yesterday prediction spot on. I took 2 trades by your timing -both profit. My own trades loses. Better follow your system. Very impresed.Thanks Al. 12/4/2009 7:25:19 AM MT Al****:: GM all-good luck today. 12/4/2009 6:56:24 AM MT FG:: Gm all...the trading alert will be post in this echat room today?